One of the coolest new features we've added to Voxox recently is not actually in the desktop client, but on the Voxox web site. It's a web-based crowd-sourcing application called UserVoice, which enables users such as yourself to provide product feature suggestions, bug reports and other important feedback on our beta service. It's a web-based crowd-sourcing application called UserVoice, which enables users such as yourself to provide product feature suggestions, bug reports and other important feedback on our beta service. What sets this tool apart is the ability to vote on each product suggestion, whether your own or someone else's. This allows you -- and us -- to see the "wisdom of the crowds," i.e., what does the majority want to see added to Voxox, what bugs are hot right now and need to be fixed? You'll be able to see this the moment you visit the site. For example, right now you'll see that using Voxox with SIP devices is number one on the the list, with a total of 167 votes. This means essentially that many people would like to be able to incorporate Voxox with a SIP-compatible handset at home (SIP stands for Session Initiated Protocol, but I won't bore you with the details). 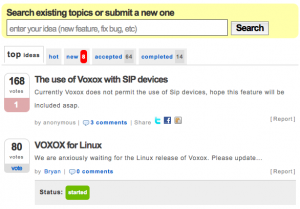 Second on the list is folks who would like to see a Linux version of Voxox. Each person on UserVoice gets 10 votes -- so use them wisely. You can get more by changing your vote, or getting credited when something is completed. Another great thing about the service is that it allows you to see the status of each product suggestion or bug report. For example, you can see that the Linux project has already been started (sorry, can't give you a completion date here), while the PayPal suggestion down below is being "planned," i.e. on the roadmap. Before you leave a comment or product suggestion, however, be sure to do a quick search in the search box at the top. This will allow you to see if anyone has already submitted that suggestion. Finally, one last tip -- be sure to log in to UserVoice using your Voxox username and password. That way, when the status changes on something you've voted upon -- for example a suggestion is now live -- you'll get an email notification right away. So give us your wisdom -- try out the new service today. In the future, you can access the feedback portal by clicking on the support link in the upper-right hand corner of the Voxox web site (accessible from any page). From there, click on "suggestions" or "report bug" in the left-hand column. We value your feedback as we refine and enhance our beta service!